Lettuce (Lactuca sativa L.) is the most popular salad vegetable. Its high fiber but low nutrient value makes it an ideal vegetable for those who watch their diet. There are many types of lettuce. The most popular locally is the crisphead type, which includes grand rapid type varieties. Oakleaf and Lollo Rossa. Other types are Romaine/Cos and the Butterhead/Bostoan and Bibb lettuce. Lettuce is a semi-temperate vegetable requiring cool temperatures of 15-200C. The iceberg varieties will not form heads in hotter areas. It can also be planted in low elevations during November to December. The quality is best in high elevations (1000 m asl). About 150-200 g of seeds is required per hectare. The best method of seedling production is by line sowing in seed boxes or nursery beds with a soil mixture of 2 parts garden soil, 2 parts manure and 1 part rice hull charcoal. Water before sowing. Make lines 7-10 cm apart. Sow 200-400 seeds/m. Cover with the same mixture and mulch with rice hull or fine rice straw. Water daily and prick to nursery trays with the same soil mix after germination. Maintain under partial shade and harden by exposure to full sunlight one week before transplanting. The seedlings are ready for transplanting 3-4 weeks from sowing. Prepare the land thoroughly. Make beds 0.75-1.0 m wide. Incorporate generous amounts of animal manure at 10-20t/ha. Use rice hull to improve soil texture. Water the beds properly before transplanting. If the rice straw is available, mulch the beds and transplant at 30-40 cm x 30-40 cm, 2-3 rows/bed to intercrop onion, chives, or garlic in the beds with marigold. Water the plants regularly. Use furrow irrigation, if available. Mulching helps conserve soil moisture. Apply sufficient animal manure at transplanting. Use tea manure or legume tea once a week, or as needed. Prepare tea manure by soaking manure in plastic drum. After two days, the resulting mixture, tea manure, is used as fertilizer to boost plant growth. Legume tea is prepared by soaking leaves of ipil-ipil or madre de cacao in water. The mixture is ready after 6-10 days. Lettuce has few significant pests and diseases. In case of cabbage looper and aphids, use botanical pesticides or soap solution. Bacterial rot can be minimized by sanitation. Harvest iceberg lettuce at 45-60 days from transplanting, when heads are firm. 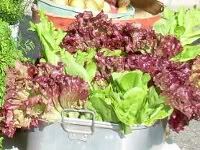 Harvest loose-leaf lettuce as needed, preferably before bolting. For large-scale planting, sort the heads in the field and pack immediately in perforated carton boxes. If available, vacuum cooling to 10C is best. Transport at 40C.